To make your life easier, we have implemented custom post types for better organization. Custom Post Types include Gabfire media and photo galleries (see video), services, and testimonials. Getting your business website launched has never been easier. Using theme options panel, you can set most recent posts to display on featured slider or posts based on a category, specific user-defined tag, or custom field values. You are not limited to posts only. 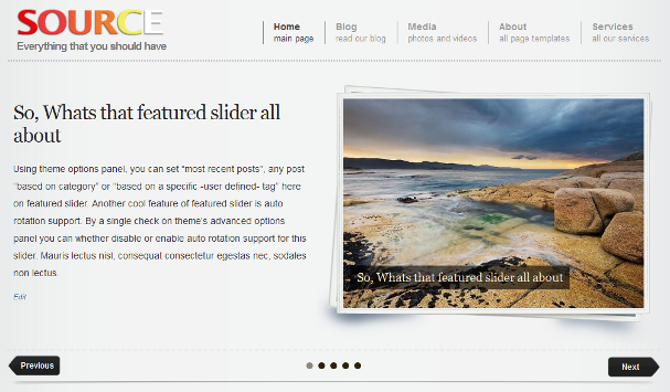 Featured slider has support to display static pages as well. Talk about flexibility! Continuing with the ease and flexibility motto, the theme also allows to choose from a default, a two-column, or a gallery layout for category archives. 5 Responses to "Source – A Complete Theme Framework"
Is this theme still available for purchase?